We really enjoyed our stay. The location is fantastic - a great place for a family trip to the beach. The house was beautiful and spacious. Our three boys enjoyed the space to run around and the outside shower. Love how much storage was in kitchen but it did make it a hunt every time we needed something. Loved the desk area for checking up on my homework. Many fans was a good thing alough dinning room area needed a little boost of light. Over all it fit our needs and we had a wonderful time. If you are looking to just hang at the house and spend time with your family this place is great. Most all sightseeing or grocery needs are 30plus minutes away. This property was amazing and Keith was super quick with the communication which was very helpful throughout our booking and stay. We came for an easy going family vacation. The house is cozy and a little old school, but more than perfect for a beach retreat. We rented out both the front and back units and they connected on the inside which was perfect for accommodating a group of extended family. We cooked most of our meals at the house (the kitchen was well stocked with pots, pans, and utensils to make this possible). Location is perfect. 5-10 min walk to the beach. Easy to do even with small children. Neighborhood is pretty quiet. Neighbors are friendly. Restaurants and shops are walkable within 14-20 min. The property comes with round 1 of laundry detergent, dishwasher detergent, sponge, paper towels, trash bags, and toilet paper. Bring a supply if you think you will need more. And bring your beach towels, beach gear, and maybe a wagon to make transporting to the beach easier. Thanks for a great week! This house is HUGE & a 5 minute walk to the beach! It could easily be a comfortable stay for 2 or 3 small families. The host was awesome and allowed our family to check in a few hours early after a long drive from Tx! This house even has a second living room upstairs and plenty of seating & utensils for a family breakfast at home. The pool is an added bonus for sure. This home was walking distance to plenty of restaurants, shops, and our favorite dessert place Ritas. This place has so much to offer if you are going to gulf shores, al. We enjoyed our stay at San Carlos. My Mom and sisters and I thought the location was fabulous and the view was divine. It was delightful to walk right out of the condo to the beach. The condo was comfortable and roomy for the 4 of us, and we really appreciated the 3 bathrooms for 4 women. It was convenient to have laundry right there. Be aware that you will need to provide your own dish soap, laundry soap, trash bags and toilet paper if your stay is more than a day or two. This house is HUGE & a 5-minute walk to the beach! It could easily be a comfortable stay for 2 or 3 small families. The host was awesome and allowed our family to check in a few hours early after a long drive from Tx! This house even has a second living room upstairs and plenty of seating & utensils for a family breakfast at home. The pool is an added bonus for sure. This home was walking distance to plenty of restaurants, shops, and our favorite dessert place Ritas. This place has so much to offer if you are going to gulf shores, al. Our extended family came and stayed at the Dream Fisher. We've been a few times now and every time we leave feeling relaxed with new memories. It is the perfect home for an extended family with two separate living areas when you need your privacy, but shared common areas for when you want to visit. This was helpful for us because we have two little boys that go to bed early and wake up early! The outside area was perfect for the adults to enjoy a drink while the cousins played with scooters in the driveway and around the neighborhood. 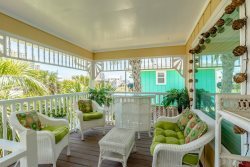 One of the great things about this property is that it is within walking distance to a charming little bay and Flipper's Restaurant. We went with our children one morning and caught hermit crabs. The home is wonderfully decorated and cute, but also homey and relaxing. We love everything about coming here. From the bike rides, to the local restaurants, to the white sand beaches, this place has been a dream come true for our family. Every time we leave our children ask when we are coming back. We would definitely recommend this vacation home to others. Absolutely Wonderful! We had a wonderful stay at the Dream Fisher 5. Our family gathered (from Missouri and Georgia) and stayed here over Christmas. It had plenty of room for the ten of us.The decor was perfect, with high end furnishings. Upon questioning, Keith provided us with a Christmas tree to decorate while we were there. We truly enjoyed our time staying here, and look forward to staying here again in the future. Thank you again for a great experience! Wonderful 18th floor condo right on the beach overlooking the Gulf. Very spacious with a large kitchen, three bedrooms, and three full baths. We were three couples with plenty of room and our own private spaces. We especially enjoyed spending time on the large balcony. Beautiful sunrises and sunsets. Great location with easy access to shops and restaurants. Relaxing! This house was a really good fit to our family's needs, allowed us all room to just hang out and relax for the week! Worked out having two ovens for Thanksgiving! Loved it so, my family wants to come back next year! Thank you for sharing your home! We had a great fall break - walked to the Shrimp Festival! This was out first time to Gulf Shores and we can't wait to come back! Proximity to my father's house one block away was this property's initial appeal to us. The fact that it was pet friendly with a fenced yard was also a huge plus. Also appreciated the layout so that 2 groups could stay at the same site but maintain privacy. The upstairs decor was attractive and both units were well appointed. Loved the big screen tv and surround sound upstairs. Unfortunately, the upstairs refrigerator was dripping water inside. We sopped up the water as we placed groceries in in frig upon arrival, but water continued to drip gradually, making it a hassle to keep all the groceries we'd bought from spoiling. We also found checking out a little confusing since emailed directions differed from the website's instructions for checking out. The upstairs unit was not as clean as we'd expected. For example, there was a cigar on the upstairs deck when we arrived--in a nonsmoking property. And bedrooms 2 and 3 were pretty small. On the whole, we had an enjoyable stay and will consider reserving it again.